The other night the sky was an eery shade of green which is not a good sign. That generally means storms are on the way. 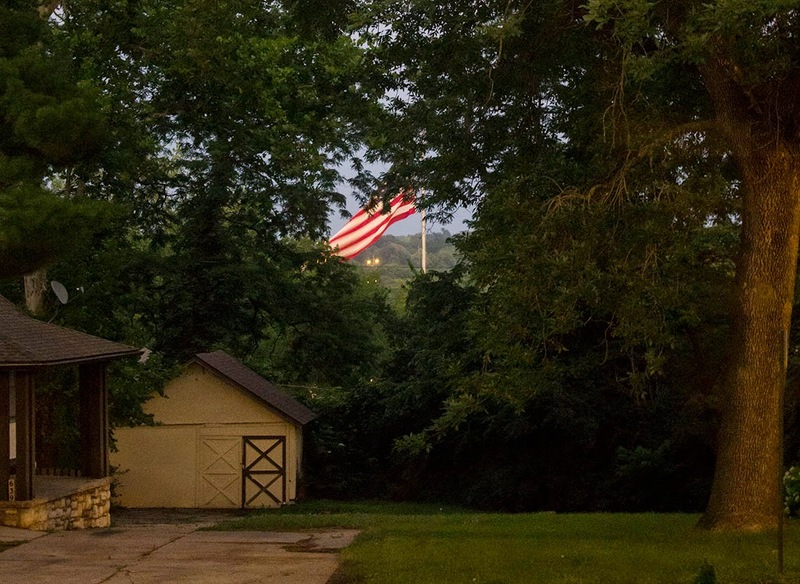 But, I looked out my front door and noticed the flag was framed by a heart shape of foliage and decided to grab my camera. I'm not that great at photography, but really wanted this image to show my family. When I was sharing it with my son, Eric, he said, "Mom it's not a heart but the shape of the United States of America." He's correct! He pointed out Alaska, Texas, Florida, and the upper east coast. Do you see it? What better frame for our beautiful flag! I'm a proud American who will be celebrating this 4th of July by working and then enjoying some fireworks. Are you a proud American? I know the polls show a sharp decline in the number of Americans who are proud and patriotic. We may not like what goes on in politics but we can still stand tall and proud of our country! I love getting up each morning and looking out at this beautiful symbol of our nation. That gave me chills! Wow. True, we may not like to see the decline we are in, but we love our nation all the same. Thanks to Eric for pointing that out to you! First, I saw the heart, then the US of A after you mentioned it! Wonderful shot. Have a great weekend. I am, indeed, a proud American...one of the proudest around !! I so love our beautiful country. This is an awesome photo..thanks so much for sharing. Have a safe and fun 4th. Love the map your son saw in the trees, how cool is that! I love this country too, despite our problems it is still the best place to live! I love how Eric's house is coming along. Looking good! What a perfect photo, Cathie! Hope you had a wonderful 4th!